You don’t have to be a watch enthusiast to be able to recognize a Rolex watch. The watch company has designed and produced some of the most famous watches in the world, such as the Submariner, the Daytona, the Datejust, and the GMT Master. Although Rolex watches are easily recognizable, it’s not always easy to distinguish a real Rolex from a fake. The companies that produce fake Rolexes can mimic small details, so it’s becoming more difficult to distinguish the differences. 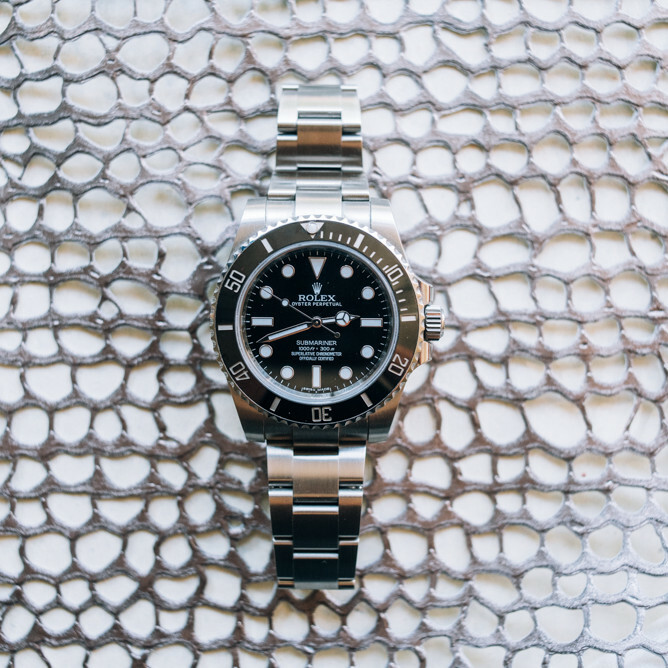 Whenever you buy a Rolex, especially if you buy it online, you need to take few precautions. 1. Watch the Second Hand - The second hand should rotate smoothly around the face of the dial. If you notice it jerks with each tick, then it’s a fake. 2. Listen Closely - Can you hear a ticking sound coming from the watch? If so, then beware. Genuine Rolex watch do not have an audible ticking sound. 3. Pick it Up - Notice the weight. Because Rolex watches are made from high-quality metals, they are often heavier than their fake counterparts. 4. Pay Attention to Details - Rolex is known for their attention to detail. The crown is anything but simple with intricate grooves and engravings. Look at the dial, the indices, the logo, and any text that is engraved into the watch. If the text bleeds, if the words appears uneven, or if the spacing is inconsistent, then you may have found a fake. 5. Check the Date - Rolex watches with a date window will also include a Cyclops lens. The Cyclops lens will magnify the date by 2.5 times the normal size. If you look down directly through the Cyclops lens, the date should be larger than if you were to look at the date from the side. The date should be in the center of the Cyclops lens. Note: Many fake Rolex watches will include a Cyclops lens, but they often do not magnify the date to the full 2.5 times. The companies that produce replica Rolex watches will also make the font larger, so the date appears to be magnified. 6. Turn it Over - One of the easiest ways to spot a fake is to look at the case back. Rolex almost always uses a plain polished metal case back without any engravings. If your watch includes engravings, the company logo, or a transparent, skeleton case, then it’s probably a fake. Note: We said “almost always”. You should check to make sure that your watch is supposed to have a plain metal case back. For instance, the Sea Dweller has “Rolex Oyster Original Gas Escape Valve” engraved in an arc around the outside of the case back. 7. Question the Hands - Do your research and identify which style of hands are used for which Rolex models. There are often slight differences that you can notice. For instance, the Yacht-Masters have a thicker minute hand. The Daytona’s hands are rounded on the ends and slightly longer, reaching to the hash marks. The Day-Date’s have shorter hands with flat tips. 8. Evaluate the Metal Quality - All real Rolex watches use stainless steel, 18k gold, or platinum. You will not find a 14k gold or gold-plated watch. If you notice that the gold is fading and metal is showing through, then you have a reason to be concerned. 9. Don’t Forget About the Bracelet - Lie your Rolex down flat. The bracelet should lie straight without any kinks. The links should fit together nicely and there should be no sharp edges. 10. Research the Model and Serial Numbers - One of the most important steps in evaluating your Rolex is to check out the model and serial numbers. Simply find the numbers between the lugs or on the inside bezel under the crystal. Then plug these numbers into Google. Looking up the model case number will determine if the number corresponds to the correct model. Long story short: If it seems too good to be true, then proceed with caution. You should always research the dealer before making any purchase. If the dealer has poor reviews or a history of selling fakes, run away and don’t look back. If you’ve purchased a Rolex and you’re still not sure if it’s real or fake, then take it to a certified watchmaker. They’ll open the case back, inspect the movement, and determine whether or not you have a genuine Rolex. Make sure you do not attempt to inspect the movement by yourself. This can cause serious damage to your watch.